My Security Shield is a new rogue antispyware from the same family of rogues as Security Master AV, My Security Engine, etc. My Security Shield is not a legitimate security tool. It looks like a normal antispyware tool, but in reality, this program can not remove viruses, trojans, etc., nor will be protect your computer from legitimate future infections. My Security Shield created with one purpose to trick you into purchasing the full version of the software. During installation, My Security Shield will configure itself to run automatically every time when your computer starts. 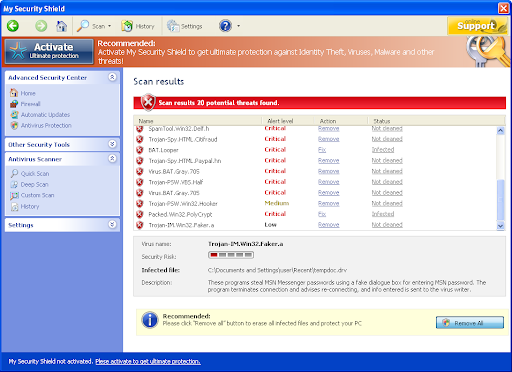 After that, it will create several files on your computer, which later, during the scan, will detect as infections. These fake infection can only be removed with a full version of the program. Obviously, such results are a fraud, the program want to scare you into thinking that your computer is infected with malicious software. While My Security Shield is running, it will flood your computer with fake security alert and notifications from Windows task bar. Furthermore, the rogue may disable Task Manager, block antivirus and antispyware tools from running and hijack Internet Explorer so, that it will display various misleading notifications. As you can see, My Security Shield is absolutely useless and what is more, even dangerous software. Most importantly, do not purchase it. Instead, please use the My Security Shield removal guide or the steps below to remove this malware from your computer for free.